If you've been in the shop over the past several weeks you may have observed the very talented Ila Starks working on this McKenna Ryan project. It's finished and hanging at the shop now. Stop by . . . no imagine on a computer screen could do justice to this beautiful piece. 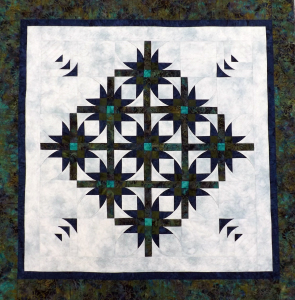 We have both patterns and kits available and you can make one of the seven elements or all of them to create this beautiful wall hanging. 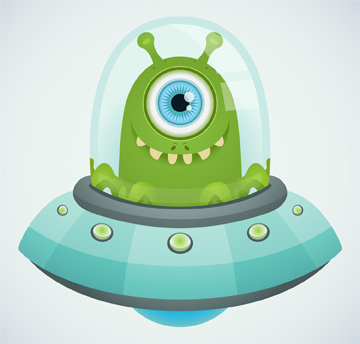 The UFO Challenge is underway and we've already registered projects for many of our creative customers. Are you ready to get those unfinished objects out of your sewing room and into use? Click here to download the details. Join is on one of these dates to make your postcard for this nationwide event. Cost for the kit is only $5. If you can't make one of the dates/times here, pick up a kit and create your masterpiece at home. More details here. Tip of the Week is a new feature in the Quiltzette. Each week you'll find a quick tip to make your sewing and quilting better, faster, easier, or more fun. This week's tips come from CQC staff member Judy Bryan. 1. Save a plastic container that your rotary blades come in. Use a Sharpie to mark one "used" and put old blades inside for safe disposal. 2. Store used hand and sewing machine needles in an old prescription bottle. When it gets full tape it closed and toss it without concern about getting poked when you take out the trash. 3. Always unplug your iron and machine when you're finished sewing. Don't let a power surge ruin your valuable equipment. Make this modern 68″ x 86″ quilt over a six month period (two blocks per month) using the Quick Curve ruler. Envision it in brights, batik, or even thirties fabric. Use a dark background for a completely different look. 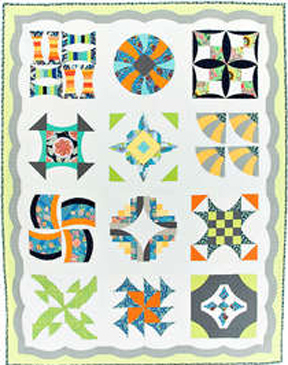 Note that these are traditional quilt blocks turned curvy giving them a fresh new feel. Judy Bryan will teach this class series. Purchase a BERNINA 560 sewing machine any time during January and take home a Tutto sewing case on wheels for FREE. This is a $209 value. Choose from one of five great colors. Having a Tutto case to go with your new BERNINA will make going to classes and retreats a breeze. Don't miss out on this special offer! P. S. We now have all of our most popular BERNINA models in stock and ready to take home today! P. S. S. Remember to ask us about zero percent financing on your new BERNINA. 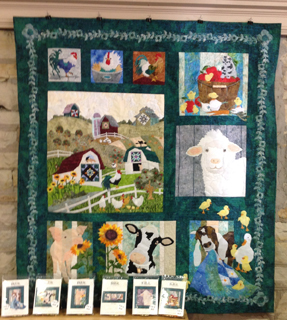 Cortez Quilt Company is proud to be the sponsor of this new exhibit at the Durango Arts Center. An opening reception will be held on Friday, January 9 from 5-7 p.m. and the show runs through January 31. Get the details here.